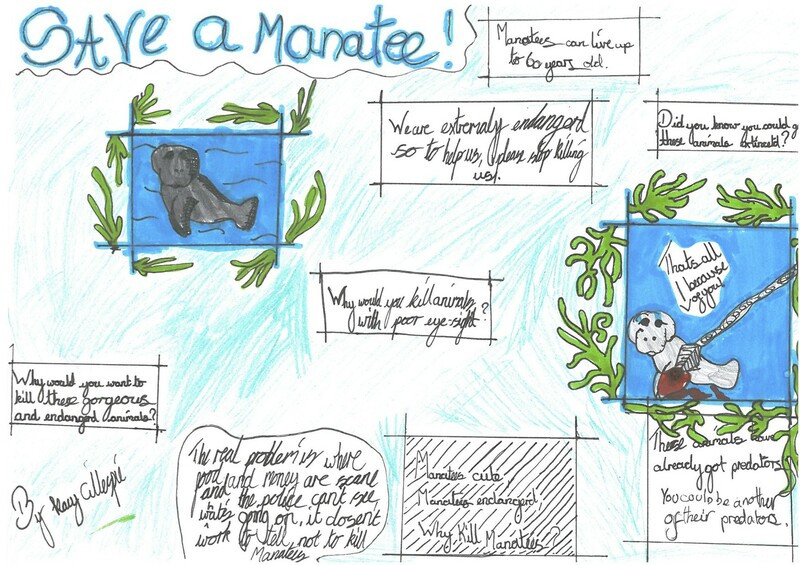 Take a peek at the latest email from Rudyard Kipling’s Y4 classes to Nicola Davies, complete with more fabulous Manatee posters! We are reading your fantastic book and were really proud of it as we know you have spent a lot of your time writing it! 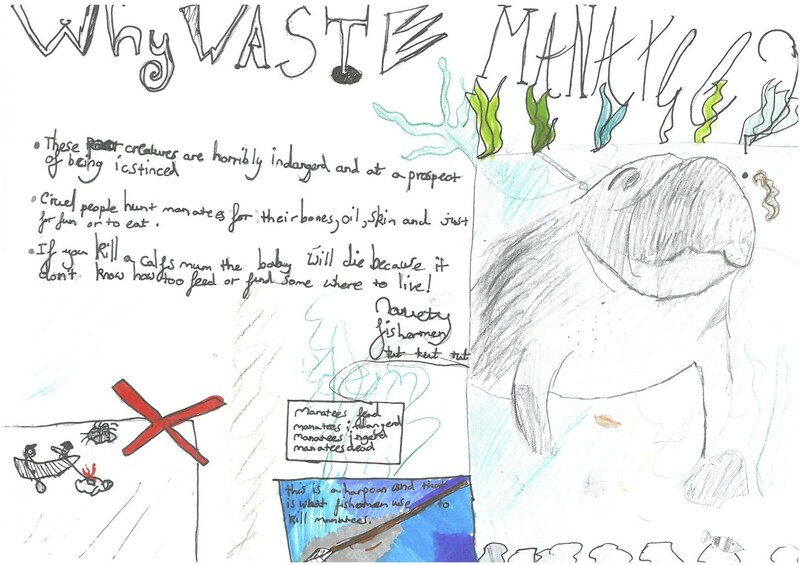 This week we have made conservation posters that we are going to send to you when our teacher scans them in. 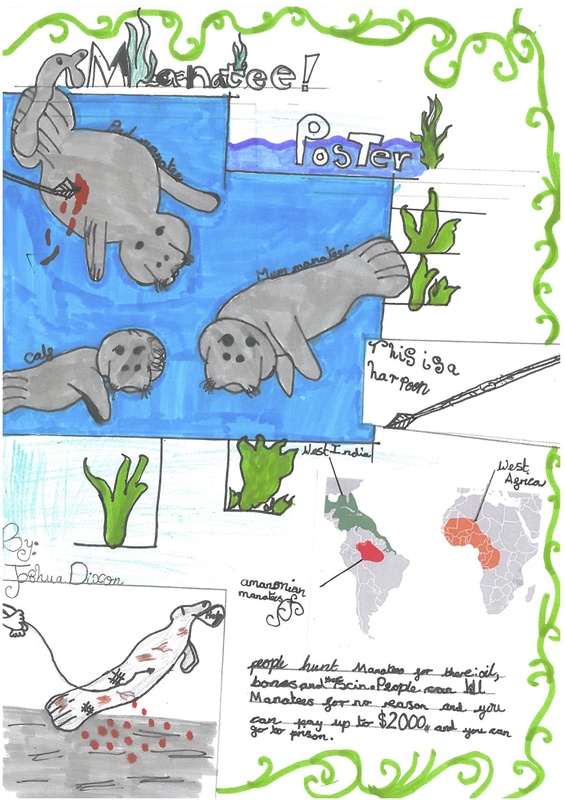 We are learning lots about Manatee conservation, which has helped us with our posters. We have found a brilliant website that allows us to watch LIVE manatees everyday! The website is: http://www.savethemanatee.org/savethemanateecam.html The website has shown us real manatees in their homes. We have started to give them names because of their scars. Its brilliant! Here are some questions for you! 1. What was the favorite book of yours that you have written? 2. What was your favorite animal when you were in school? 3. Why did you want to write books? 4. Have you named any manatees in captivity yourself? 5. What has been your favorite adventure you have been on to research a book? Oh and we hope you find that extremely rare specie of leopard. We all reeeeeeeeeally want to see one more of your books! Our teacher (Mr Scutt) has told us that you were very kind and sent us more books! Totally awesome! We are looking forward to finishing manatee baby and starting another one! You are really the best author we have read, and we are all begging to see someone as skilled as you(which of course is going to be nearly impossible! We are dieing to meet you Nicola!!!!! Hope you can get more books and you can find that rare leopard!